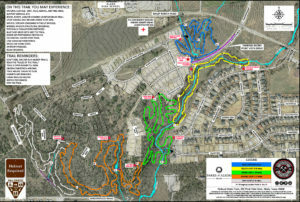 Developer James R. Harris Partners invests $100,000 in building the newest mountain bike trails in North Texas, an unusual amenity winding for 6.12 miles through 67 acres of contiguous green space in the middle of the Parks of Aledo residential development. (l-r) Paul “Shadow” Johns, Parks of Aledo Trails builder; Larry Colvin, Parks of Aledo Trails designer. (l-r) Larry Colvin; Justin Welborn, managing partner, Parks of Aledo development; Paul “Shadow” Johns. Parks of Aledo Trails Map. 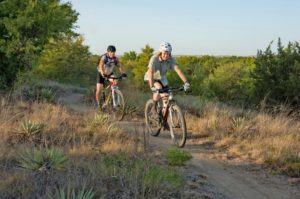 ALEDO, Texas – The Parks of Aledo Trails (POA Trails), the newest mountain bike trails in North Texas, are now open and free to the public. Located in Parker County about midway between Weatherford and Fort Worth, the 6.12 miles of trails wind through 67 acres of scenic green space in Point Vista, a subdivision of the Parks of Aledo residential development (POA), www.parksofaledo.com. The primary trailhead is at 302 Point Vista Drive, Aledo, TX 76608. Professionally designed and built for sustainability and fun, the POA Trails have the best wayfinding features of any mountain bike trails in North Texas. 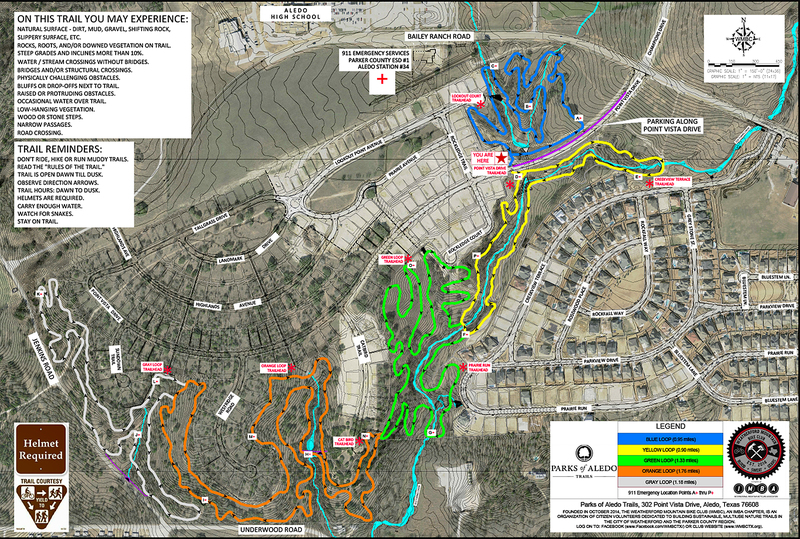 The map of the trails (POA Trails Map) is posted on the Facebook page of the Weatherford Mountain Bike Club (WMBC), in kiosks along the trails and on the POA website. WMBC will steward the trails along with the land manager, James R. Harris Partners (JRHP); the POA community; and area residents. POA is the $240 million residential development of 233 acres of the Bailey Ranch being developed by Fort Worth-based JRHP. 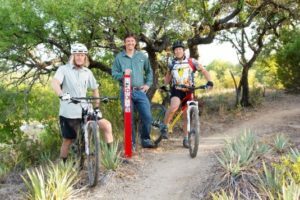 Justin Welborn, managing partner of the project and a partner of JRHP, decided to invest $100,000 in turning the green space of Point Vista into hike and mountain bike nature trails, an amenity not only for the POA homeowners but also for the public – an unusual choice for a private land developer. An avid mountain biker since his youth, Welborn knew of the increasing popularity of the sport of off-road bicycling in North Texas. Currently, there are about 2,000 members in the three mountain bike clubs in Weatherford, Fort Worth and Dallas. The International Mountain Bicycling Association (IMBA) has about 80,000 members. There are 38 different multiuse nature trail networks within a 2-hour drive of the Dallas-Fort Worth metro area. Unlike the privately owned POA Trails, the lands where those trails are located are owned and managed by 18 different municipal, state and federal governmental entities. They are all built, maintained and operated by volunteers of nonprofit mountain bike clubs. Welborn knew that groups of dedicated volunteers normally worked for years to create mountain bike trails. To speed up the process, he hired Baird, Hampton & Brown, Inc., (BHB) of Weatherford, Fort Worth and Grapevine, the engineer of record of POA, to design the trails. Larry Colvin, BHB’s project manager for the POA Trails, headed the design team. His 34 years of experience in the civil engineering and landscape architecture industry include 10 years designing and constructing mountain bike trails. An avid mountain biker, he is president of WMBC. To build the trails, Welborn and Colvin selected Paul “Shadow” Johns of Shadow Trail Designs, Dallas. Johns has been designing and building hike and bike trails in the North Texas area since 2005. Finishing the trails in less than four months, he said that these trails would have taken volunteers three or more years to complete. “Shadow has a tremendous following among experienced mountain bikers; he has either built or had a lot of influence over many of the trails built in DFW,” Welborn said. Johns built the challenging 6.12 miles of trails according to the BHB-designed trail alignment and IMBA guidelines, considered the gold standard for trail design. Fitting within the natural beauty of Point Vista’s open green space, the trails run alongside and over Old Tunnel Creek in the middle of the existing vegetation and trees. Gently rolling terrain with open spaces is dotted with yucca, prickly pear and other colorful endemic plants. The singletrack, soft-surface trails are made of native material with a trail tread ranging from 18 inches to 42 inches and a trail corridor measuring 6 feet wide and 7 feet high. A stacked-loop system with 3 bypasses, the trails are composed of 5 connecting loops. The Blue, Yellow, Green and Gray Loops are each about one mile in length; the Orange Loop is about 2 miles long. “These trails have the best signage of any I’ve ever seen, whether it’s city, state, or national parks,” said Welborn. Colvin agrees. “They are the best-marked trails in North Texas,” he said. 6 points of entry allow easy access to the trails. 40 signs along the trails provide notices and reminders. Each loop has color-coded signage to direct the user. Each loop is one-way in a clockwise direction, except for the Blue Loop, which is counterclockwise. The Blue, Green and Orange Loops have 2 trailheads; the Yellow and Gray Loops have 1 trailhead; a color map of the trails and Rules of the Trails are posted on each trailhead’s kiosk. In case of emergency, the trails have 16 EMT points alphabetized, A to P, and GPS-marked to aid the nearby Emergency Medical Technicians of the Aledo Fire Department in identifying a location. The POA Trails are about 15 miles from either Fort Worth or Weatherford. On I-20, turn south on FM 1187, turn west on Bailey Ranch Road, then turn south on Point Vista Drive. The primary trailhead kiosk will be on the west side (driver’s righthand side facing south) at 302 Point Vista Drive, Aledo, 76608; park along the west side. The Weatherford Mountain Bike Club (WMBC), a 501 (c) (3) nonprofit organization, consists of citizen volunteers dedicated to building sustainable multiuse trails. Its mission is to establish guidelines and a framework for cooperation between the Club and the City of Weatherford and the Parker County region to build, maintain and manage multiuse nature trails in the city and county jurisdictions for the benefit of the off-road bicycling, trail running and hiking communities and the citizens of Parker County. WMBC, a chapter of the International Mountain Bicycling Association, advances its mission through volunteer efforts regarding sustainability, conservation, education, partnerships and community involvement with like-minded community advocates focusing on mountain biking, trail building and all the health and welfare benefits associated with the sport. Baird, Hampton & Brown provides complete, integrated services including Land Surveying; Civil Engineering and Site Development; Mechanical, Electrical & Plumbing Engineering and Design; and Landscape Architecture. Since 1992, the multidisciplinary firm has been providing innovative design solutions to complex projects for public- and private-sector clients. Its professionals are experienced in the design of new construction as well as renovations to modernize and improve the efficiency of facilities. The Fort Worth-based firm has offices in Grapevine and Weatherford. Shadow Trail Designs, a design/build contractor, builds natural surface hiking and biking trails for city and county parks as well as independent developers and private landowners. The company, established in 2015 by Paul “Shadow” Johns, has a reputation in the recreational trail-user community for building quality, sustainable trails. Many local and state mountain bike and running races have been held on Shadow’s trails to rave reviews. He gained experience by volunteering for more than 10 years and close to 8000 hours to construct trails for the Dallas Off-Road Bicycle Association (DORBA), a nonprofit mountain bike club. As DORBA’s Vice President of Trails (2012-2013), he was responsible for working with trail stewards to coordinate the maintenance of more than 20 individual trail networks in the DFW area. James R. Harris Partners, LLC (JRHP) and its affiliated firms provide real estate services in land development, homebuilding for new and established residential neighborhoods and commercial development. Founded in 1979, Fort Worth-based JRHP has become a proven resource for landowners wanting to sell their property and for equity investors seeking investment opportunities. JRHP’s residential developments in Dallas/Fort Worth encompass more than 70,000 homesites valued at approximately $3 billion. JRHP expanded to Austin in 1992. The residential developments of its affiliate, Harris & Straub, total more than 6,500 homesites valued at approximately $450 million.